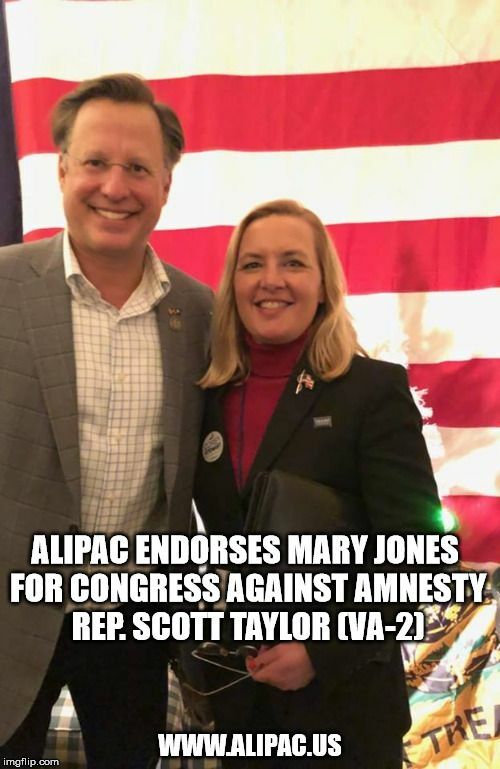 ALIPAC is endorsing Congressman Scott Taylor's GOP primary opponent, Mary Jones, today because Jones opposes DACA Dream Act Amnesty for illegal immigrants while freshman incumbent Taylor's name is the first listed on ALIPAC's Kate's List for supporting Amnesty. ALIPAC is launching an early wave of endorsements for the 2018 primaries to remind Republican lawmakers like Scott Taylor they will have to face very angry voters back home if they pass DACA Amnesty by the government shutdown deadline of December 22 as Democrats and 34 Republican members of Congress demand. Rep. Scott Taylor recently received a lot of bad press for joining 33 others on an open letter to Speaker Ryan asking for DACA Amnesty to be passed in 2017! Large majorities of Republican primary voters oppose DACA Amnesty and are likely to throw incumbents like Scott Taylor out of office like Eric Cantor if strong challengers like Mary Jones file to run. Mary Jones completed ALIPAC's 2018 federal candidate survey indicating she will "Support Americans and legal immigrants by supporting the adequate enforcement of America's existing border and immigration laws as the US Constitution requires for the protection of American jobs, elections, taxpayer resources, health, and lives." "Mary Jones answered our 2018 candidate survey indicating she supports the existing border and immigration laws of America while simultaneously opposing DACA, Dream Act, or Comprehensive Amnesty that would further undermine our laws," said William Gheen, President of ALIPAC. "Scott Taylor's support for DACA Amnesty shows he is more focused on helping illegals and their employers than protecting American jobs, taxpayer resources, and lives like Kate Steinle's." ALIPAC is currently endorsing 42 federal candidates including Mary Jones which can be viewed on the organization's endorsements page. (View) ALIPAC supporters are asked to vote for, volunteer for, and individually donate to endorsed candidates. While every Republican lawmaker in Washington is eager to run from the term "Amnesty" because they know it has the power to cost them their seats in Congress, ALIPAC.us is the world's largest archive of information on the topic of illegal immigration and contains records and articles showing their true positions. More GOP challengers like Mary Jones are emerging all across America to take on Republicans like Scott Taylor in Washington DC who listen to pro-Amnesty special interest groups more than the American citizens they swore an oath to serve. For more information about ALIPAC's efforts to replace pro-Amnesty lawmakers with pro-America Republican insurgents in the 2018 primaries, please visit www.ALIPAC.us. Last edited by ALIPAC; 12-18-2017 at 12:11 PM. Then call Rep. Scott Taylor's DC offices (202) 225-4215 to proclaim "I'm supporting Mary Jones for Congress because Rep. Taylor supports DACA Amnesty for illegals!" ALIPAC Endorses Scott Brown for US Senate!